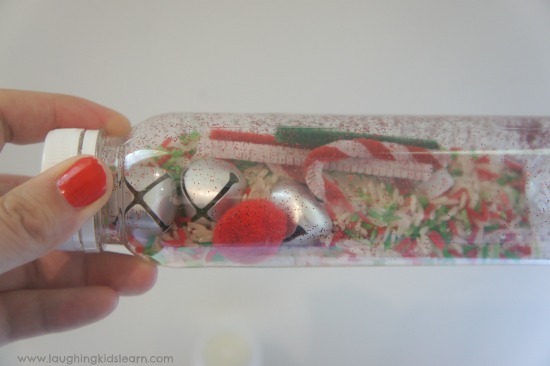 Here are some adorable Christmas sensory bottle for babies and toddlers. They are super easy to make and will captivate and delight your little one. Sensory bottles are great for developing visual and audial senses, which is how we learn about the world around us. Christmas is such an exciting time of year and it’s lovely to include some handmade toys amongst the many other manufactured toys. 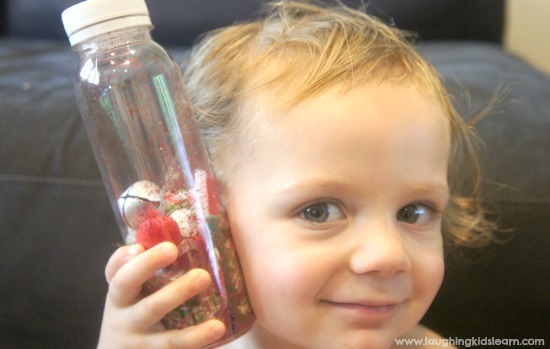 A sensory bottle is such a lovely toy for a young child to play with. As well as the above items, I included 1 tbsp of red glitter, 1 cup of plain rice, 1 cup of dyed green rice and 1 cup of dyed red rice. This made it look a little more like Christmas. If you’d like to know how to dye rice then click here. This sensory bottle is wonderful as it’s interesting for children to look at and watch as the pieces move about inside the bottle. It’s also lovely to hear the rice and the tinkle of the Christmas bells inside. 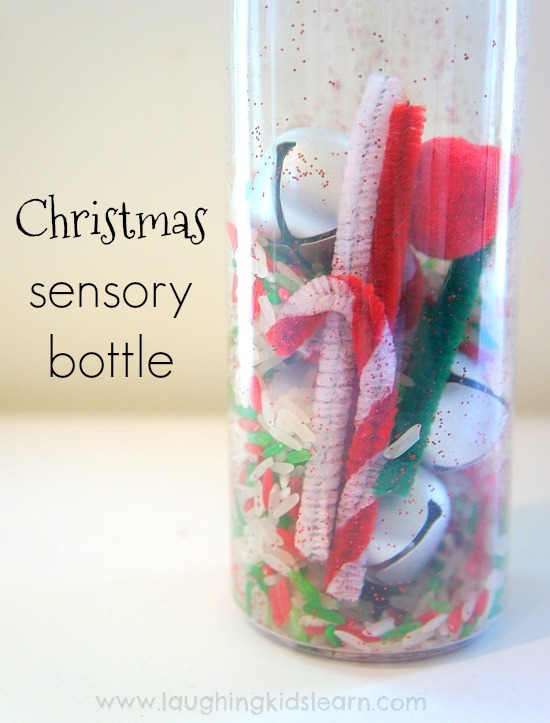 Here is a video of me making a variety of sensory bottles, including this Christmas sensory bottle. My little Boo (2 years) absolutely loved helping me make this Christmas sensory bottle. She loves walking around the house with it and shake it, stop and see where the bells end up etc. It’s so great and I love that it’s her own little piece of Christmas. 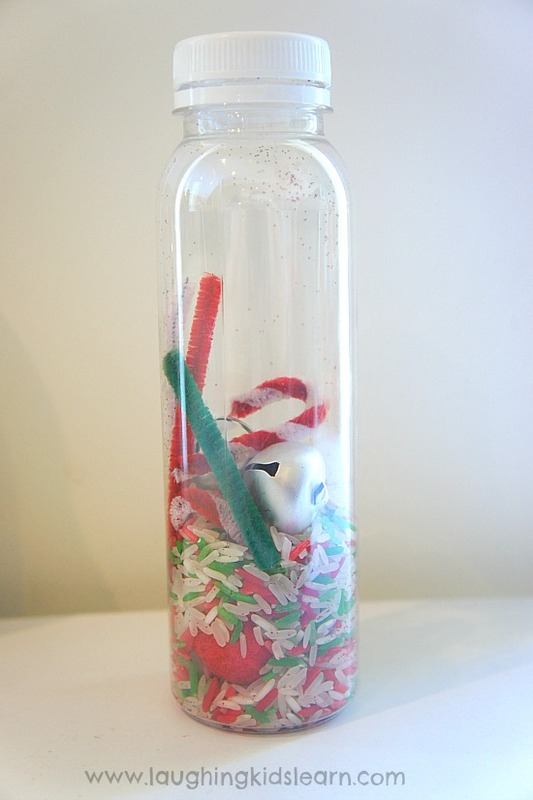 Would your child like to play with a Christmas sensory bottle? Hello, you’ve missed out what we will need; for the contents of the bottle, it’s blank in the article above? And there is no hyperlink to find out how to dye the rice. Kellie, how lucky am I to have you! Thanks for pointing that out for me. DOH! I’ll get onto fixing it now. I know you are busy…I was hoping for some more “holiday” project ideas…for 3 year olds…. Joy, never too busy for gorgeous followers like you. Absolutely! I taught preschool for 40 years in Madison, Wisconsin. I retired in 2013 but I have 3 granddaughters (15, 5 and 2) who I like to do activities with. I also am guardian for my 80 year old sister in law, who has Alzheimer’s. Alzheimer’s patients have a lot in common with 3-5 year olds. I love your site and have shared it with others. Oh Gail, you sound AMAZING. I completely agree with you, these sensory bottles are great for all ages. They are so easy to make for others to enjoy too. 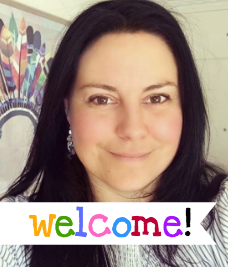 Thank you for your kind words and sharing my blog with others. Wishing you a great Christmas ahead. Love your video, and what a great idea. Sensory bottles would be good for elderly as well I think. Thanks for your kind words. I hope to do more Facebook Live videos shortly. Oh Carly, that’s so wonderful! We have been playing with our Christmas sensory bottle ever since I made it. Thank you so kindly for your support and I wish you and your family a beautiful and safe Christmas. I’ve been wanting to make a new sensory bottle for my toddler and this is perfect! I love that is has the extra element of sound with the jingle bells – my daughter will love that. Thanks for sharing Kate! Thank you so kindly Stacey! I love the tinkle sound of jingly Christmas bells.